Freba Areba Hammers was born on 28 May 1914 in Eufaula, McIntosh County, Oklahoma. As of 1931,her married name was Bagwell. She married Hershel W. Bagwell, son of Adolphus Leroy Martin Bagwell and Pearlie Mae Logan, in 1931. Freba Areba Hammers died on 8 July 2003 in Selma, Fresno County, California, at age 89. She was buried at Fowler Cemetery, Fowler, Fresno County, California. Cora G. Dimmick was born on 19 March 1896. As of after 1912,her married name was Bagwell. She married Samuel Bagwell, son of Stuart Mathis Bagwell and Martha E. Baldwin, after 1912. Cora G. Dimmick died on 25 August 1974 at age 78. She was buried at Woodland Cemetery, Ironton, Lawrence County, Ohio. Infant Bagwell died on 11 February 1950 in Clinton, Laurens County, South Carolina. He was born on 11 February 1950 in Clinton, Laurens County, South Carolina. He was the son of John William Bagwell and Cloda Edwards. Infant Bagwell was buried at Reedy Grove Pentecostal Church Cemetery, Waterloo, Laurens County, South Carolina. John Curtis Bagwell was born circa 1944. He was the son of John William Bagwell and Cloda Edwards. John Curtis Bagwell died before 2005. Ronnie Eugene Bagwell was born circa 1944. He was the son of John William Bagwell and Cloda Edwards. Ronnie Eugene Bagwell died before 2005. Linda Bagwell was born circa 1944. She was the daughter of John William Bagwell and Cloda Edwards. Linda Bagwell died before 2005. (?) White married Betty Bagwell, daughter of John William Bagwell and Cloda Edwards, after 1960. Madelyn Bright Gladney was born on 18 November 1925. As of 17 September 1947,her married name was Bagwell. She married Jeff Wilson Bagwell, son of George Earl Bagwell and Velma A. Watts, on 17 September 1947 at First Methodist Church, Jasper, Alabama. Madelyn Bright Gladney died on 30 November 1976 at age 51. She was buried at Elmwood Cemetery, Birmingham, Jefferson County, Alabama. Roy Boy Bagwell was also known as Roy Bagwell.1 He was born on 25 October 1945. He was the son of Harvey Wayland Bagwell and Estella P. Martin. Roy Boy Bagwell lived in 2010 in Caballo, New Mexico.1 He died on 15 July 2018 at age 72 He was a CMSGT in the US Air Force during the Vietnam War. He was buried at Arizonia Veterans Memorial Cemetery, Marana, Pima County, Azizonia. Gaylord Richardson was born in 1940. He married Wanda Nell Bagwell, daughter of Harvey Wayland Bagwell and Estella P. Martin, after 1955. Gaylord Richardson and Wanda Nell Bagwell were divorced on 15 May 1981 at Denver, Colorado. Gaylord Richardson married an unknown person on 18 September 1983 at Clark County, Colorado. He died on 6 July 2014. He was buried at Chapell Hill Memorial Gardens, Littleton, Arapahoe County, Colorado. (?) Taylor married Eva Jo Bagwell, daughter of Harvey Wayland Bagwell and Estella P. Martin, after 1950. Doris Taylor Bagwell, 44, of Louisville, Mississippi, died at the Winston County Medical Center in Louisville after a lengthy illness. She was a member of the First Baptist Church in Louisville. She is survived by her husband, Coley Bagwell of Louisville, her father, Cecil N. Taylor, Sr., and her mother, Pearl L. Taylor of Duck Hill, two daughters, Patty Elizabeth Bagwell and Nancy Ann Bagwell, both of Louisville; two sons, Corey Todd Bagwell and David Rye Bagwell, both of Louisville and one brother, Cecil N. Taylor, Jr., of Winona. Services were held in Louisville Saturday, March 11 at 11:00 A.M. with the Rev. Bob Mounts officiating. Burial was in the Memorial Gardens in Louisville with Nowell Funeral Home in charge of the arrangements. She was buried at Memorial Park, Louisville, Winston County, Mississippi. Darnald Miller was born on 13 September 1927. He married Jo Anne Bagwell, daughter of John Milton Bagwell and Willye Era Fulcher, on 6 January 1943. Darnald Miller died on 23 May 2013 at age 85. He was buried at Murphy Creek Cemetery, Louisville, Winston County, Mississippi. Patty Elizabeth Bagwell is the daughter of Codie L. Bagwell and Doris Elizabeth Taylor. Nancy Ann Bagwell is the daughter of Codie L. Bagwell and Doris Elizabeth Taylor. Corey Todd Bagwell is the son of Codie L. Bagwell and Doris Elizabeth Taylor. David Rye Bagwell is the son of Codie L. Bagwell and Doris Elizabeth Taylor. Richard Lacey married Margaret Ross "Maggie" Bagwell, daughter of David Ashley Bagwell and Julie Ross Lott. Richard Lacey IV is the son of Richard Lacey and Margaret Ross "Maggie" Bagwell. Odessa Maye Tillman married Hulan Bascomb Bagwell, son of Henry Bascomb Bagwell and Ruby Ellen James, before 1957. Henry Lee Bagwell is the son of Hulan Bascomb Bagwell and Odessa Maye Tillman. Delora Lawrence married Leon Franklin Bagwell, son of William John "Willie" Bagwell and Maud Wafer, on 17 August 1945 at Rockwall, Texas. Funeral services for Robert J. (Bobby Jack) Bagwell will be held at 10 am Monday, November 21, 2011 at Temple Baptist Church, Winnsboro, LA under the direction of Gill First National Funeral Home with Dr. Harry Boyd, Jr. officiating. Interment will follow in Providence Memorial Cemetery of Winnsboro. Robert was born in Choudrant, LA to the union of Willie M. and Velma O'Neal Bagwell on August 24, 1929 and departed this earthly life in Alexandria, LA on November 18, 2011. A graduate of Louisiana Tech, he was teacher and coach at the Bossier City and Baskin High Schools for seven years. Serving in various capacities with Chemical and Oil and Gas companies seventeen years before becoming employed by the LA Department of Labor in Minden and Natchitoches. He retired in 1990 as Supervisor of the Natchitoches office. Ordained a Deacon by the Rayne, LA Baptist Church in 1962, he served as an adult Sunday School teacher most of his adult life as well as filling the duties of church treasurer and Deacon. Robert was preceded in death by his parents and sisters, Alistine Simmons and Mary Grace Ormond. Survivors include Ruby McNair Bagwell, his wife of 58 years; sons William Bagwell and wife Wanda of Scottsdale, AZ and Rev. Richard Bagwell and wife Jana of Auburn, AL; grandchildren Brooke Stephens and husband Mark; Meredith, Kyle, Ross, Mallory and Mark Bagwell; great-grandchild Chloe Stephens; brothers William J. Bagwell and wife Joyce and Bruce B. Bagwell; brother-in-law Phil Simmons and sisters-in-law Mary Eva Bagwell and Nancy Ormond; plus numerous nieces and nephews. Pallbearers will be grandsons along with Mark Stephens and Howard Way. Honorary pallbearers will be the young men he coached while at Baskin High School. In lieu of flowers, memorial donations may be made to the Dr. James O. McNair Scholarship Fund at Louisiana College in Pineville, LA. Visitation will be from 5-8 pm, Sunday, November 20, 2011 at the funeral home. Online condolences may be made at www.gillfirstnational.com. He was buried at Providence Memorial Park Cemetery, Winnsboro, Franklin Parish, Louisiana. Ruby McNair was born on 21 December 1929 in Baskin, Franklin Parish, Louisiana. 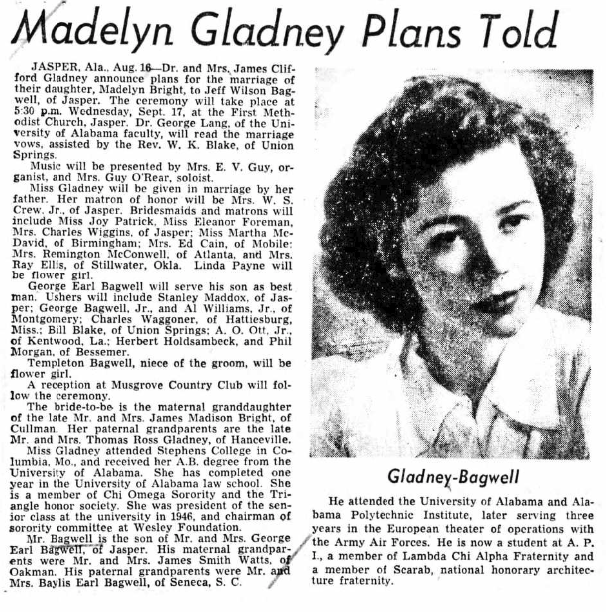 As of after 1945,her married name was Bagwell. She married Robert “Bobby Jack” Bagwell, son of William Mallory Bagwell and Carrie Velma O'Neal, after 1945. Ruby McNair died on 22 October 2018 in Phoenix, Maricopa County, Arizonia, at age 88. She was buried at Providence Memorial Park Cemetery, Winnsboro, Franklin Parish, Louisiana. William R. Bagwell is the son of Robert “Bobby Jack” Bagwell and Ruby McNair. Reverend Richard W. Bagwell is the son of Robert “Bobby Jack” Bagwell and Ruby McNair. Alistine Bagwell was born on 17 November 1924. She was the daughter of William Mallory Bagwell and Carrie Velma O'Neal. As of after 1941,her married name was Simmons. Alistine Bagwell married (?) Simmons after 1941. Alistine Bagwell died on 21 March 1985 at age 60. She was buried at Sibley Cemetery, Sibley, Lincoln Parish, Louisiana. Mary Grace Bagwell was born on 26 October 1931. She was the daughter of William Mallory Bagwell and Carrie Velma O'Neal. As of after 1948,her married name was Ormond. Mary Grace Bagwell married (?) Ormond after 1948. Mary Grace Bagwell died on 16 June 1995 at age 63. She was buried at Sibley Cemetery, Sibley, Lincoln Parish, Louisiana. (?) Ormond married Mary Grace Bagwell, daughter of William Mallory Bagwell and Carrie Velma O'Neal, after 1948. (?) Simmons married Alistine Bagwell, daughter of William Mallory Bagwell and Carrie Velma O'Neal, after 1941.